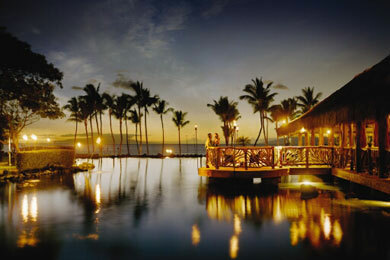 Wailea is known as Maui’s strip of high quality, luxury resorts lining the wide expanse of beach. 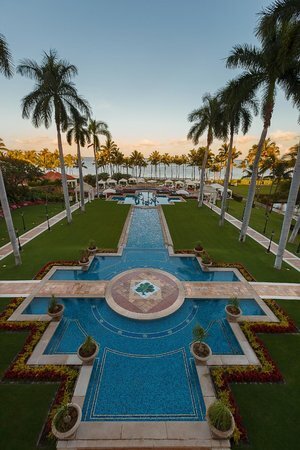 In the midst of this collection sits the pink grand dame, the Grand Wailea, which has reigned supreme in this location for more than 20 years (most recently becoming part of the Waldorf-Astoria Collection). The resort spans across 40 lush, tropical acres with 780 rooms and suites, fine dining with menus created by world-famous chefs, kids’ and family programming, the largest spa in all of Hawaii, and pools with a water park so popular, islanders make reservations just to visit it. 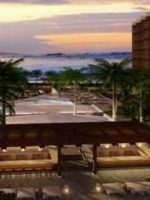 In August 2014, the resort began renovations and remodeling of guestrooms, pool areas and meeting spaces; all updates will be complete by early 2015. Standard rooms at the Grand Wailea are placed in categories by view: Garden, Terrace, Ocean Front and Ocean View. All feature private lanais, empty mini-fridges, 55-inch, flat-screen TV's and marble bathrooms. Cribs are available upon request. These rooms offer views of the Grand Wailea landscaping and feature one king or two queen beds. These offer views of Haleakala Mountain in the Molokini wing. They feature one king or two queen beds. These provide ocean and garden views and are typically on higher levels. They also feature one king or two queen beds. These provide ocean views and are on the upper floors of the Haleakala, Wailea and Molokini wings. Again, a choice of one king or two queens is available. Suites provide ocean views, higher floors, living areas, and one- to two-bedroom accommodations with sofa beds to accommodate up to eight. Located in the Lagoon and Chapel wings, these suites are typically quieter due to their location. Thirteen suites are available with one king bedroom and a living room. They can be connected to another room to create a two-bedroom suite. These large suites are located in either the Wailea or Molokini wings and feature a king bedroom and a living room, with the option of connecting to a second room to make a two-bedroom. Located in the Molokini wing, these suites provide an option of one king or two queen beds with a separate living room. The six suites also can connect to another room to create a two-bedroom suite. Housed in the Napua Tower, the Napua Suites are club suites with a private concierge and two private lounges serving free continental breakfast, snacks and hor d'oeuvres daily. 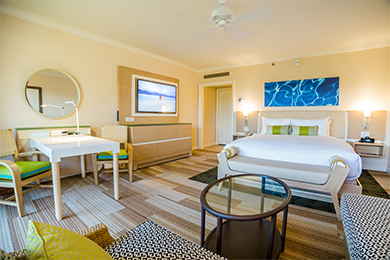 Seven standard one-bedroom Napua Suites are available, along with eight Napua Nani Suites that can be connected to another room to create a two-bedroom option. Four Napua Royal Suites are also located in the tower with parquet wood floors, oversized balconies and two-bedroom options. Napua Club Rooms are also available as standard rooms, with the same private concierge and lounge access. Three oversized suites are available for those who don't have a budget to consider. 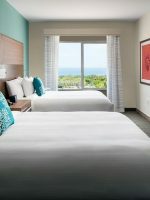 Two Grand Suites provide panoramic ocean views, two-bedroom suites with a third bedroom option, club level amenities, private lanais and luxurious amenities that include a grand piano. The resort also offers Ho'olei villas, which are private vacation rentals. These rentals feature full kitchens, dining, outdoor barbeques, garages, and up to three bedrooms. A shuttle provides service between the villas and the resort. Tired, old, musty smelly and dirty. Not the Waldorf I’ve experienced before. They had the room type incorrect upon arrival, our supposed ocean view let us see a small corner of a pool. The room smelled musty and moldy, there were cob webs hanging from the ceiling. The beach is wonderful, and the staff there went out of their way to make us comfortable. The hotel and grounds at this hotel, beautiful. The room service food quality and food served at the restaurants, not worth the money we paid. I don't mind paying higher prices for truly exceptional food, or even just good quality. Save your money and eat at the nearby surrounding restaurants. You will pay half the price and be more satisfied. There was a tile hallway outside of the room we were staying in. Anytime someone was rolling a suit case across it, the clatter of wheels on tile would wake us up at night or early in the morning... depending on who was coming and going. The main attraction for kids visiting Grand Wailea is the 25,000-plus-square-foot Wailea Canyon Activity Pool, filled with waterslides, rapids, rope swings, caves, a lazy river and a sand beach. The activity pool consists of nine pools on six different levels, connected by a lazy river. A sandy beach is a perfect place for little ones, while older kids will want to enjoy the six waterfalls, three waterslides, and a water elevator (it shoots you up with water pressure)! The pool is open from 7 a.m. to 10 p.m., with the slides open from 10 a.m. to 5 p.m., and the water elevator open from 11 a.m. to 4 p.m. Lifeguards are on duty. If the kids aren't hanging at Wailea Canyon, they will be at the Fishpipe, a rotating barrel ride. Up to three riders can ride the barrel and it can go as fast as they want it to for 90 seconds. Kids must have a parent's signature to enter, and all riders must fill out a waiver; this is one tricky ride! Rides are not inclusive to the resort and do have an additional fee per ride or as a package. Fishpipe is open from 10 a.m. to 5 p.m. The Rock is the resort's kids' club, Camp Grande. The camp provides a morning (9 a.m. to 12:30 p.m), afternoon (12:30 to 4 p.m.), full day (9 a.m. to 4 p.m.) and night camp (5 to 10 p.m.) session. Kids in the program receive snacks and lunch or dinner. The camp is not inclusive at the resort and starts at $65. 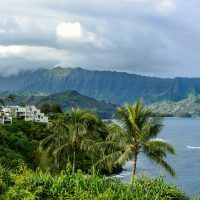 Kids can enjoy special activities like Walkie-Talkie Tag, Hawaiian Scavenger Hunts and Lei Making, as well as the facility games, including video games and table games. The indoor play area includes a soft toy room for younger kids, a game cave and a LEGO island, as well as a craft room. Outside, the Rock offers a small wading pool for young kids and is connected to the Fishpipe. At this 20,000-square-foot facility, families can also come together to learn to hula, make leis and weave Lauhala outside of the camp program. This facility, which is attached to The Rock, is the teen lounge. Perhaps because of its connection to the family facility, frequented by kids, the teens don't often seem to flock to this building. However, kids 13 to 17 can visit for Xbox, PlayStation, Wii, Ping Pong, air hockey, foosball and more. There is a snack bar here, and the facility is open from 9 a.m. to 10 p.m. The expansive beach offers a calm bay for swimming and snorkeling, as well as kayak and paddleboard rentals, and outrigger canoe trips. Throughout the year, Grand Wailea offers special activities, some of which are free and some of which require registration and cost an additional fee. Guests of the resort can enjoy the nightly torch lightening ceremony at 5:15 p.m., and check out the resort's impressive art collection through free tours, Tuesdays through Fridays at 10 a.m. Artist in Residence Programs, art classes, sand sculpture programs, luaus and more can be found in calendars at check-in for guests to plot out additional fun while on vacation. 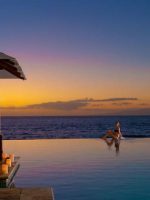 The resort's massive 50,000-square-foot spa, which consistently ranks as one of the best spas in Hawaii, provides a Keiki and Teen Spa for kids age 6 to 17. Treatments like a chocolate coconut massage, mud body cocoon, and tropical facial are available for 25 or 50 minutes. Makeovers, henna tattoos, manicures, pedicures, braids, and packages are also available. Teens 13 to 17 are also invited to use the fitness center and can take spa fitness classes and even get a fitness assessment. 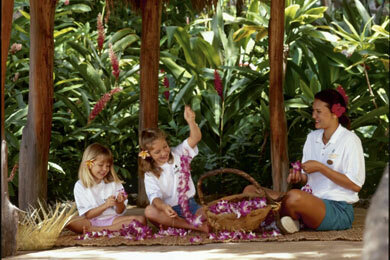 Guests of the resort can enjoy tennis or golf through the Wailea Tennis Club and the Wailea Golf Club. The resort can assist in arranging court and tee times, as well as lessons. The resort offers six dining options for families, plus specialty and in-room dining services, as well. Renowned Chef Alan Wong created a fusion Asian-American menu for this Japanese-styled restaurant, using stones from Mount Fuji. The restaurant is open for dinner only, 5 to 10 p.m., and while children of all ages are welcome, it may be best suited for older kids. From this casual, open-air restaurant in the center of the resort overlooking the pools, guests are treated with views of the islands opposite Maui. The restaurant is open from 11 a.m. to 5:30 p.m. for lunch, and to 9 p.m. for dinner, although reservations are recommended during dinner hours. Kids can enjoy All-You-Can-Eat-Spaghetti, as well as their own Keiki Menu, although they may also really enjoy pizzas from the Mac-Nut wood-burning pizza oven. It's a mouthful, but before you leave the island, you will learn how to say the name of Hawaii's state fish. With this name, it's no surprise this is the resort's seafood dinner spot. Housed in a thatch-roofed, open-air restaurant, enjoy Hawaiian- and Polynesian-inspired dishes from 5:30 to 9 p.m. Reservations are recommended. This poolside restaurant is a casual spot, where guests can dine in bathing suits. Open for lunch, guests will find salads, sandwiches, burgers, fish and the standards for a pool bar. For an extensive breakfast buffet (and a la carte menu), the Grand Dining Room is the spot, with balcony seating providing views of the ocean. Sunday brunch is a special champagne affair (reservations recommended) featuring live music and hula dancers. For grab-and-go breakfast, lunch or dinner items, as well as snacks and drinks to stock in your room, visit the resort's CafÃ© Kula. In-room dining is available for breakfast, lunch, dinner, late-night dining and snacks, including a Keiki Menu. Ask them to set your lanai table for a beautiful outdoor meal and views. You may also request (at a cost) a Sunset Cabana dinner, with a private, intimate meal prepared specifically for you and your family (requires 72 hours notice). 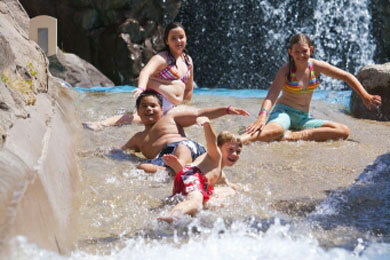 As is common at Maui resorts, Grand Wailea charges a resort fee ($25). This fee includes welcome flowers, punch and water, beach umbrellas (first come, first served), use of mountain bikes (first come, first served), Internet, twice-daily SCUBA clinics, yoga classes, phone calls, and a few "extras" that are often found in rooms, such as coffee makers, safes and mini-fridges. The pool and beach offers cabana and casabella rentals and because they may rented up to one year in advance, it's best to reserve these at the time of your room booking. Grand Wailea celebrates year-round warm weather, making it an ideal destination for any time of the year. The resort's peak season is Christmas, where a minimum seven-night stay may be required, and summers and spring break also see high occupancy. To avoid extra crowds, visit during the late spring or fall. Luckily, the large resort is spread out enough that it doesn't feel too crowded during peak seasons. Grand Wailea is centrally located along Wailea Beach on the southwest of Maui and is just 35 minutes from Kahului Airport. A cab ride from the airport will run about $75. If renting a car, the resort offers free self-parking, as well as valet parking for $30 per day. You'll likely want a car to get out and explore the whole island, though you could easily spend your entire vacation at the resort. If kids are away enjoying all the kids' programming, mom and dad may want to head to the Hibiscus Pool, which is known as a "quiet" pool (adult pool for guests 18 and up). The Botero Bar offers live music and drinks from 5 to 9:30 p.m. daily, and the Grotto Bar is a swim-up bar perfect for an afternoon cocktail in the pool. Not to be missed is the resort's Spa Grande, a 50,000-square-foot spa that features an impressive Terme Hydrotherapy Circuit. Before receiving a treatment (or after), enjoy the circuit, which features a Western corner with a Roman Whirlpool with a cold plunge, a dry sauna and a eucalyptus steam room; an Eastern corner with traditional Japanese Furo baths with hot and cold plunges; and the Hawaiian Islands corner. This special section includes five sea salts baths of different colors and salts representing five Hawaiian Islands with different detoxifying benefits. Between dips, stand beneath one of three waterfall showers for a neck and shoulder massage, or tropical showers with 50 jets massaging your entire body from head to toe. The experience is heavenly. Move on to enjoy body treatments, massages, facials, and salon treatments. The spa is connected to a 5,000-square-foot, two-story fitness center.